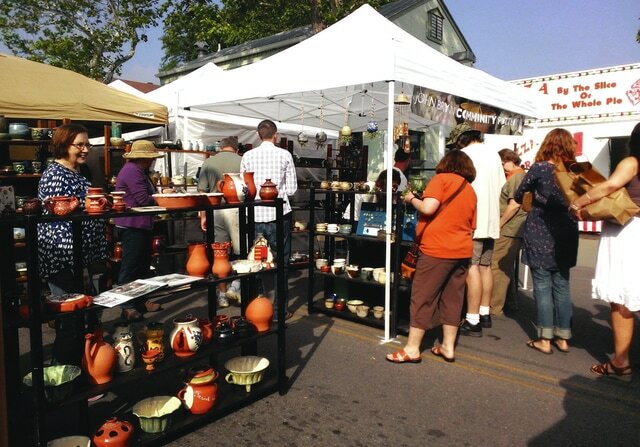 YELLOW SPRINGS — Yellow Springs will showcase itself Saturday as Street Fair takes place. Nearly 20,000 are expected to attend the annual event which features a couple of major additions, according to organizers. Nearly 100 percent of the options available at the Beer Garden will be craft, the majority coming from Yellow Springs Brewery. There will be one domestic beer available, she said. Another unique twist to Street Fair is the bike valet service available this year. Attendees who ride to Yellow Springs can leave their bikes on racks right on the bike trail. Vendors will also have a local flavor. Many will return again this year but all he new vendors will be required to make their own products. In all, more than 200 are expected, including several food vendors such as Bella Sorella, Jeet India and Hunger Paynes. Jimmie’s Ladder 11 Streatery will also be joining the fair once again on Dayton Street near the Beer Garden. “It’s kind of a unique mix of everything that Yellow Springs is,” Wintrow said. The Music & Beer Fest takes place 12-7 p.m. at the Bryan Center. The musical lineup begins with Trey Stone & The Ringers at noon, followed by Speaking Suns 1 p.m; Gin-Soaked Angels 2 p.m.; Top Hat Black 3 p.m.; Nasty Bingo 4 p.m.; Grover 5 p.m. and Spanish Tony Sanchez 6 p.m. The Greene Point Stage features entertainment 10 a.m. to 4 p.m. with hourly performances featuring (in order) Zane Gerlach, Matthew Thoma, Egyptian Breeze, Megan Osman, Egyptian Breeze, Jemntonic and Mad River Railroad. There are cash parking lots in town but visitors are encouraged to use the continuous free shuttle that runs from Young’s Dairy at 6800 Springfield-Xenia Road or Yellow Springs High School at 420 E. Enon Road. The shuttle service is available 9 a.m. to 7 p.m. Check YellowSpringsOhio.org for alternate routes. Handicapped parking is available at the Municipal Lot on Corry Street. Pets are not allowed at Street Fair by ordinance and owners will be asked to leave. For more information contact the YS Chamber at 937-767-2686 or visit www.YellowSpringsOhio.org.